The rewrite ushers in a few important changes. At the top of the list: States won't have to get the secretary of education's blessing when setting their CTE goals. The secretary is also barred from dictating standards. The Education Department can step in only if states repeatedly fail to make what the overhaul calls "meaningful progress" toward the goals they set for themselves. "Because of this legislation, career and technical education programs will continue to help students succeed in the workforce of today and learn the skills for the workforce of tomorrow," Neil Bradley, executive vice president of the U.S. Chamber of Commerce, said in a statement. Though the bill passed with bipartisan support, enthusiasm from some advocacy groups was muted. The Association for Career and Technical Education praised the bill for expanding career tech into the middle grades but warned lawmakers to avoid "unintended consequences that result in setting unambitious performance targets, lower academic standards for CTE students, or force states and programs to meet onerous administrative requirements." President Trump is expected to sign the bill some time next week. U.S. Attorney General Jeff Sessions made headlines Tuesday when he addressed Turning Point USA's High School Leadership Summit, an annual conference for conservative high school students. At one point, the crowd of high-schoolers interrupted Sessions, chanting a familiar refrain from President Trump's 2016 campaign: "Lock her up!" Sessions laughed at the reference to Hillary Clinton and repeated it. Less reported was the message, about free speech on college campuses, that the students' chant interrupted. "Whether you realize it or not," Sessions told the crowd, "freedom of thought and speech on the American campus are under attack." Sessions listed a handful of recent campus events that have been interrupted or cancelled because of protests. He decried not just trigger warnings and efforts to make campuses "safe spaces" but also derided cry closets, therapy dogs, optional exams and grade inflation. 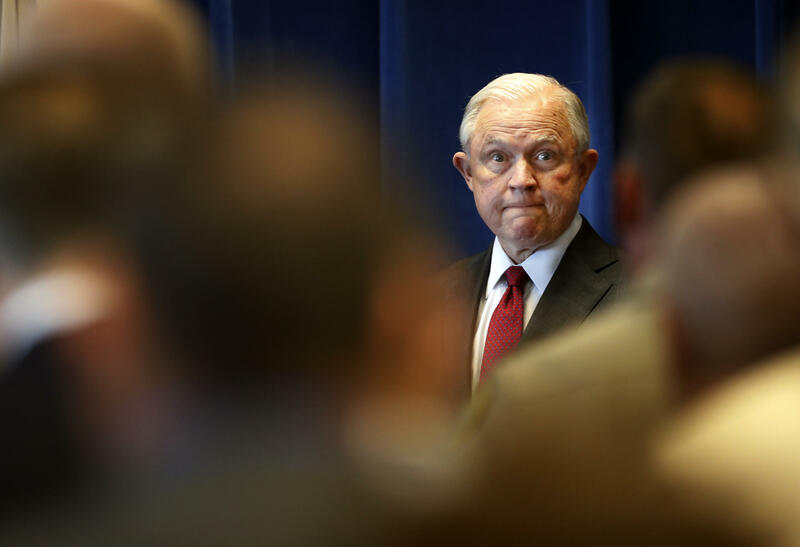 "Rather than molding a generation of mature, well-informed adults," Sessions said, "some schools are doing everything they can to create a generation of sanctimonious, sensitive, supercilious snowflakes. We're not gonna have it!" "Our country, like this College, was founded on the principles of the Enlightenment — in particular, the belief that people, you and I, possess the capacity for reason and critical thinking, and that free and open debate is the lifeblood of a democracy. Not only Wellesley, but the entire American university system — the envy of the world — was founded on those fundamental ideals. We should not abandon them; we should revere them." "It's not just sometimes folks who are mad that colleges are too liberal that have a problem. Sometimes there are folks on college campuses who are liberal, and maybe even agree with me on a bunch of issues, who sometimes aren't listening to the other side, and that's a problem too. I've heard some college campuses where they don't want to have a guest speaker who is too conservative or they don't want to read a book if it has language that is offensive to African-Americans or somehow sends a demeaning signal towards women. I gotta tell you, I don't agree with that either. I don't agree that you, when you become students at colleges, have to be coddled and protected from different points of view." DeVos reportedly scraps "gainful employment"
The week ended with a scoop by The Wall Street Journal. The newspaper reported that Education Secretary Betsy DeVos plans to dump an Obama-era rule meant to cut off access to federal student loans for colleges with too many debt-laden graduates who fail to find good-paying jobs. The for-profit college industry strongly opposed the original rule. According to the Journal, the draft regulation would instead force prospective students to do more homework of their own when shopping for schools, using the federal government's College Scorecard. The online database, created by the Obama administration, offers detailed profiles of colleges, including information about completion rates, student debt and earnings. The Education Department also released a proposed revision to Obama-era rules meant to discharge the debt of student borrowers who have been defrauded by their college or university. These so-called "borrower defense" rules were first pitched after the high-profile collapse of two massive, for-profit college chains left thousands of students in limbo and looking for relief. DeVos is proposing dramatic changes, including making it harder for students to qualify for loan forgiveness. Under the rewrite, students would have to prove intent — that their school meant to mislead them. The department may also narrow loan-forgiveness eligibility to students who are already in default. In a statement, DeVos said, "Our commitment and our focus has been and remains on protecting students from fraud." But Bob Shireman, a senior fellow at The Century Foundation and a former deputy undersecretary for education in the Obama administration, said in a statement that he believes the move would "make it next to impossible for defrauded students to get the relief they are entitled to." What if the only way to stay afloat is to consolidate with a wealthier neighboring district, but that district refuses to consolidate? It turns out, in most states, these poorer districts have little to no recourse. According to EdBuild, just nine states have the legal structure to intervene and essentially force a marriage between districts. Everywhere else, these poorer school systems, with fewer property tax dollars coming in, must make do, even if it means spending thousands of dollars less per student than schools just a few miles away in a neighboring district.